Every day is a fry-day. 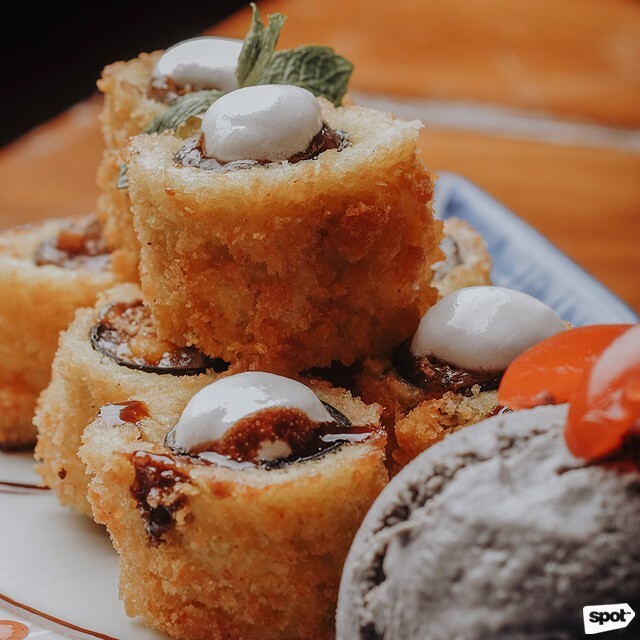 (SPOT.ph) The soul food of Osaka is kushikatsu—gloriously deep-fried, skewered meat or vegetables, dipped in a light batter and coated with bread crumbs for that distinctive crunch. 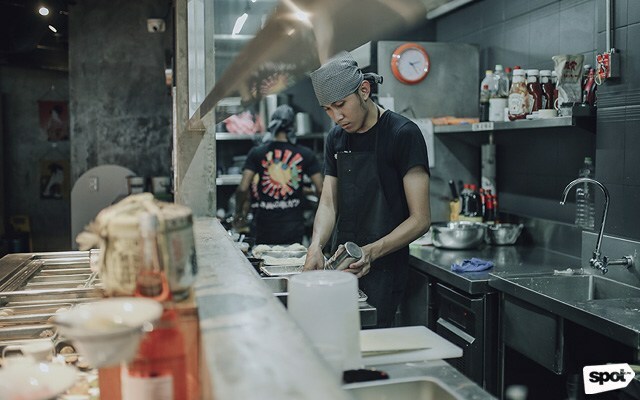 You’ll find it everywhere in Japan—from little hideaways to big establishments—and it’s something the owners of Osakatsu have always loved. 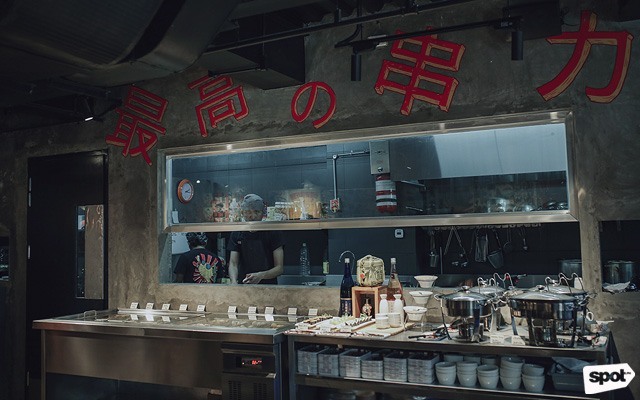 Just recently, they’ve brought to life a concept that’s not very familiar yet to the Metro’s food scene: A kushikatsu buffet. 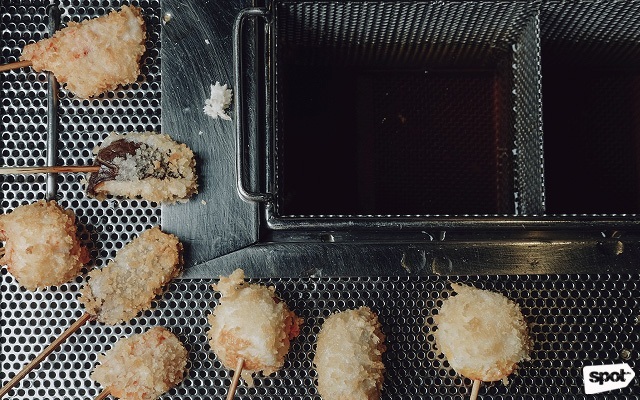 Borrowing the concept from a restaurant in Shinsekai, Osakatsu allows its customers to deep-fry their own kushikatsu. 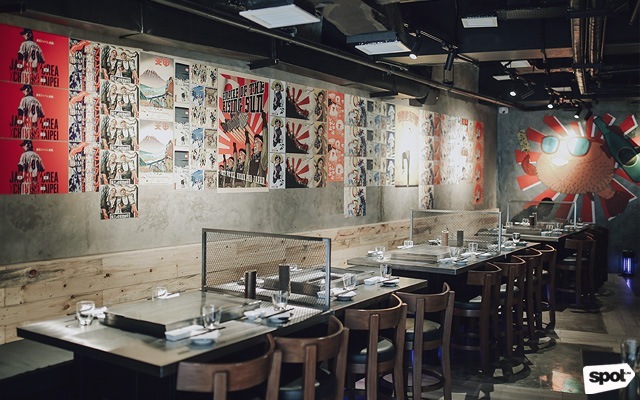 Low-key comfort is key at this Makati restaurant, with its wooden benches and industrial-slick gray concrete walls that come alive with colorful Japanese-themed posters. Meanwhile, a funky orange puffer fish with sunglasses and a big-bellied, running Glico Man holding a kushikatsu skewer add a bit of quirk. 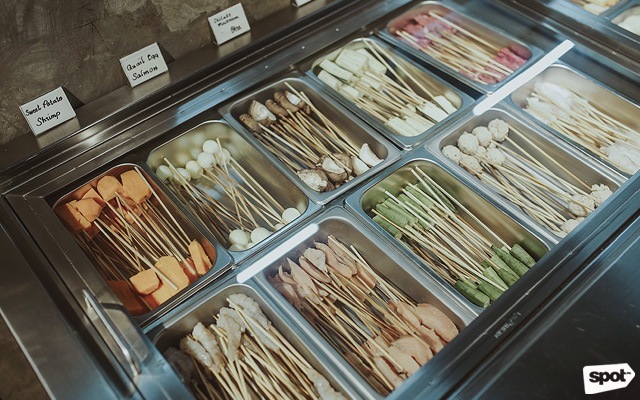 The Kushikatsu Buffet (P490/head) features an unlimited selection of up to 20 different kinds of skewers, which you can cook at your own table. 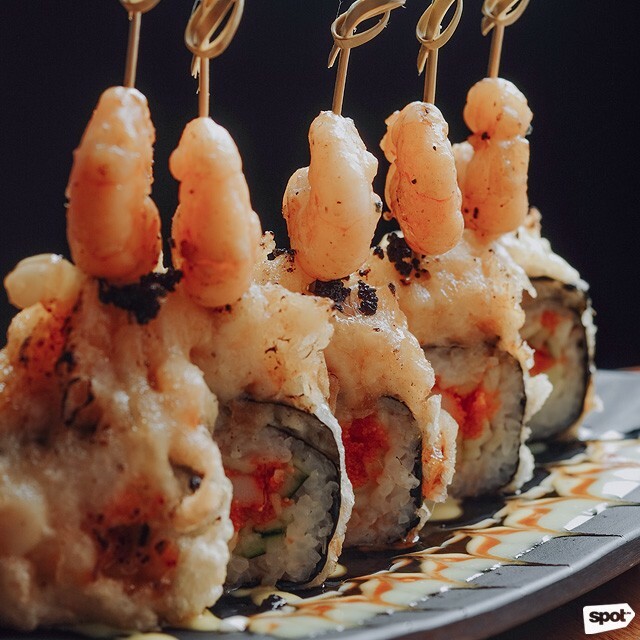 These include Sakura shrimps, sea-urchin balls, crab-roe balls, fried squid balls, cheeseballs, beef strips, and even quail eggs. But for those who want lighter options, you can also add eggplants, sweet potatoes, shiitake mushrooms, okra, and a bunch of other veggies to your plate. 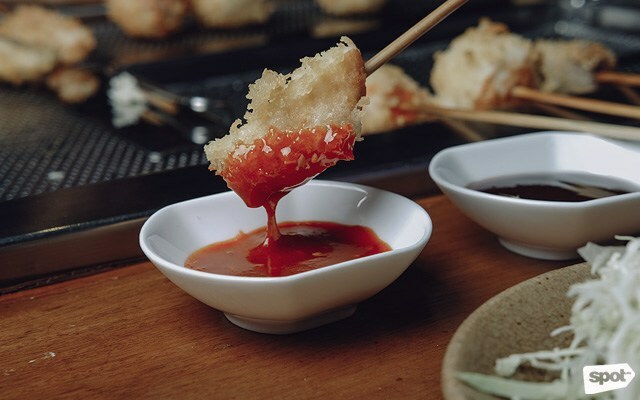 Once you’ve gathered your chosen protein and vegetables, it’s time to get messy and do some serious cooking: Roll your skewers in flour, dip them in Osakatsu’s signature batter, and coat them with panko. When they’re finally ready to swim in an ocean of gold (oil, that is), cook them for two to three minutes, then devour. Well, you could let them cool for a few seconds, too. 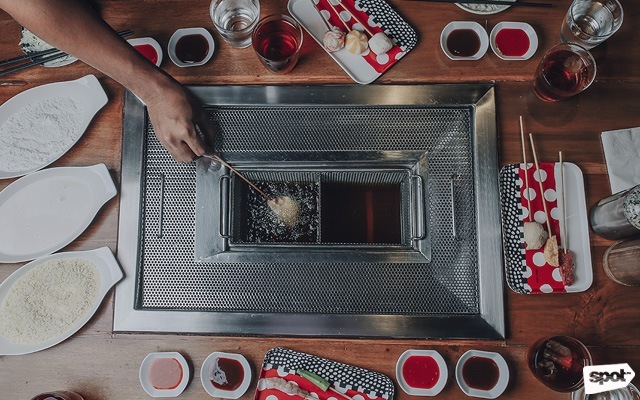 You can choose to dip your skewered creations between two sauces: Spicy and Tonkotsu. To complement the rich and savory flavors, a cabbage salad is served on the side. 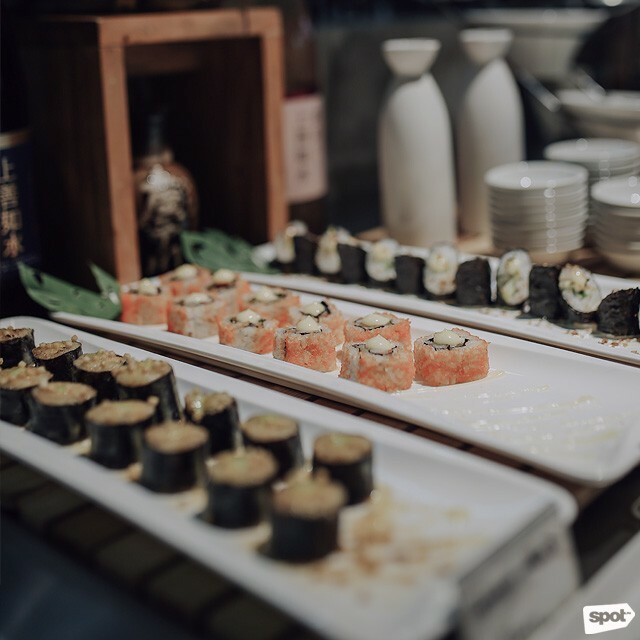 On the other hand, the buffet experience comes with half a bowl of ramen (your choice of miso, shoyu, or shio), chahan, a variety of maki, and Japanese curry. Don't forget: you're only allowed a maximum of 90 minutes to eat and cook as much as you can. The à la carte menu also holds many must-try gems. Their Makimono selection begins with a bang as Executive Chef Edo-San’s namesake dish, the Edo San Special (P580), is composed using only fresh ingredients, including crabstick, cucumber, cream cheese, black ebiko (fish roe), and anago or salt-water eel (a more luxurious version compared to fresh-water eel). 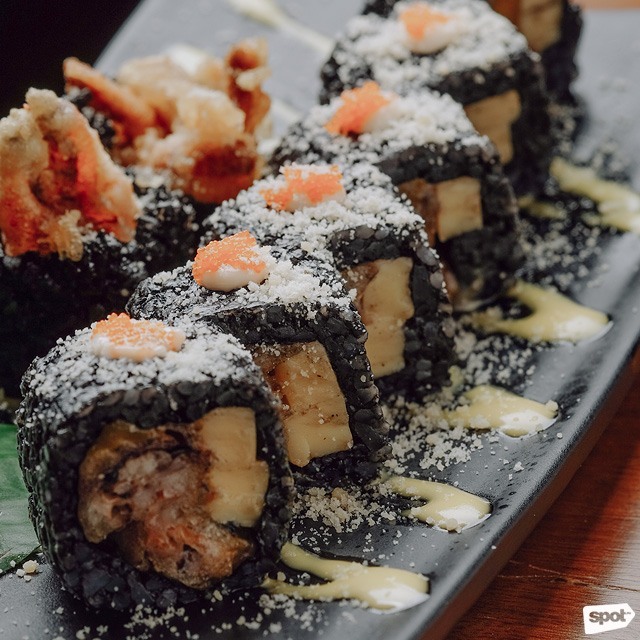 The crunchy Black Mamba (P365) surprises the senses with soft-shell crab tempura and squid ink-infused sushi rice, sprinkled with parmesan and a drizzle of mango purée. 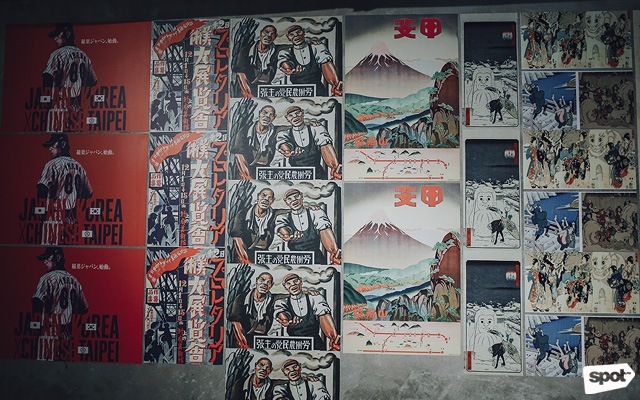 Osakatsu’s homemade sauces, including Nori and Japanese Curry are imported from Japan, while the Yamasa soy sauce they use is added with secret ingredients to give it that Osakatsu flair. 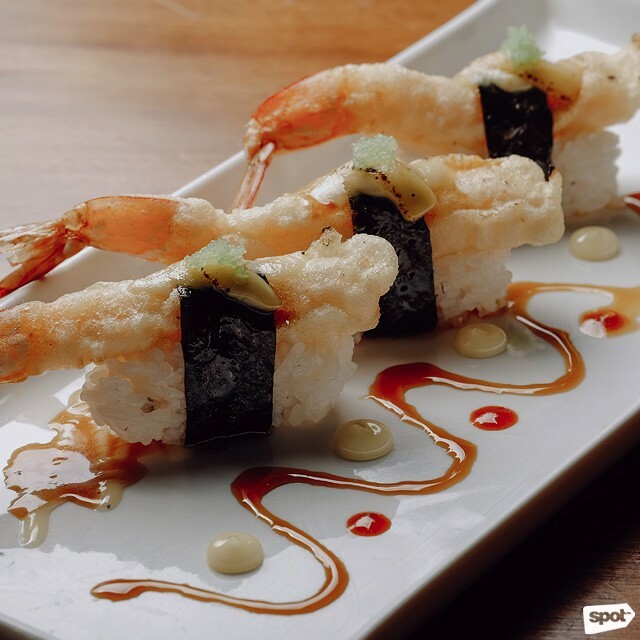 For starters, you can opt for the Aburi Tempura Sushi (P185), or shrimp tempura glazed with aburi sauce and served sushi-style. 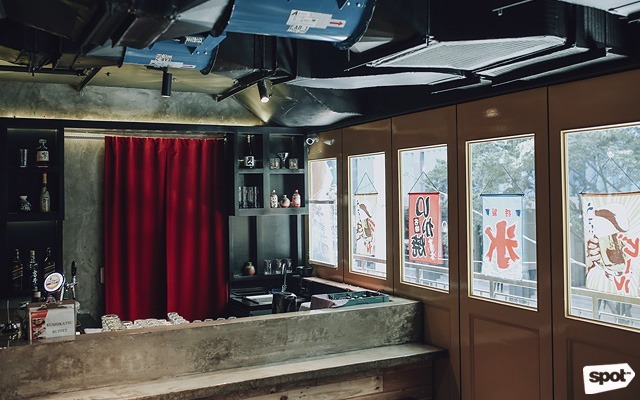 Or try the Tsukune (P165), which you'll want to munch on like potato chips. 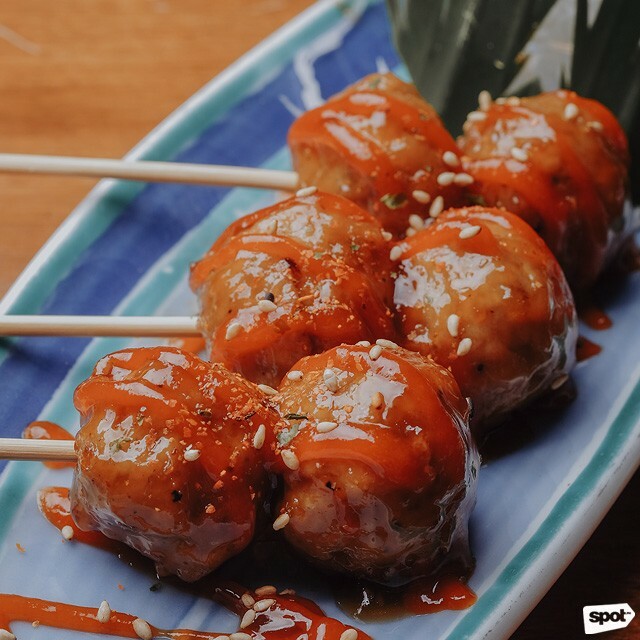 The tender skewered chicken balls melts in the mouth, and its rich spicy sauce makes it even better. 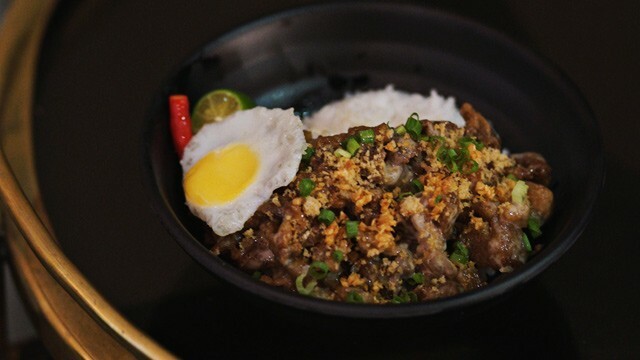 It’s best paired with beer—at the moment, they serve Kirin (P120) but will eventually have Sapporo beer on tap. 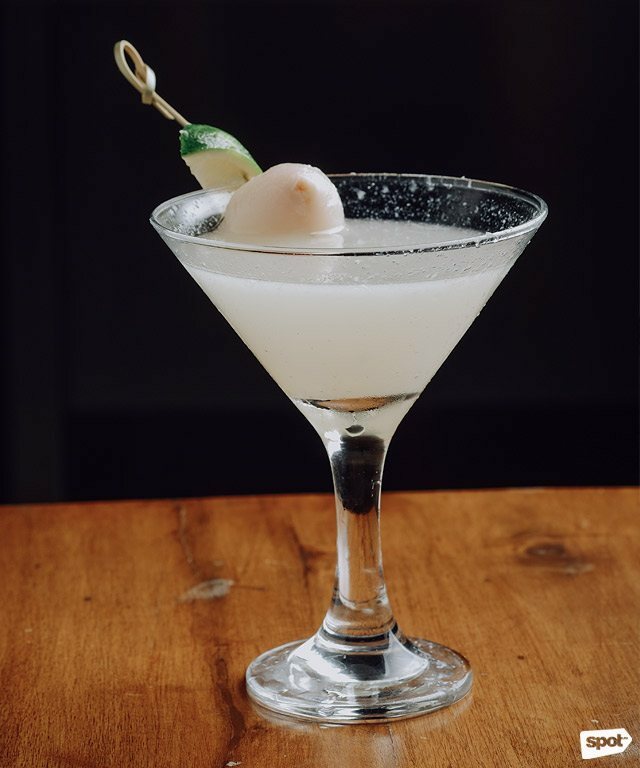 Speaking of spirits, Osakatsu also serves a good Lychee Saketini (P220), a simply delicious dose of blended lychee with Gekkeikan sake. Lemon zest gives the Ginger Honey Lemon Highball (P220) a refreshing touch, while ginger and honey are added for a spicy-sweet sensation. The Highball Mojito (P200) with fresh mint leaves is a trusty rejuvenating drink to cool you down. To punctuate the meal with a sweet note, there’s always dessert. 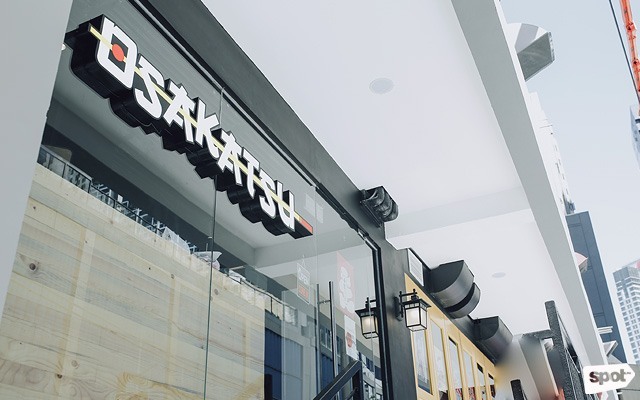 Their handcrafted Osakatsu Ice Cream (P55/scoop) comes in equally exciting flavors like wasabi and black sesame. 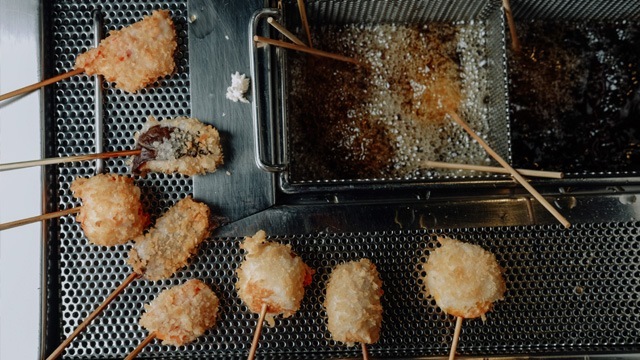 For the adventurous eater, there’s the Fried Chocolate (195), which is often described by regulars as “weirdly good.” It is a journey through layers of tastes and textures—the creamy and cold ice cream, the crunchy bread crumbs to the soft and gooey mochi, then the explosion of chocolate in contrast to the fresh sweet-tangy mango, only to transition to a warm ending of salty nori. 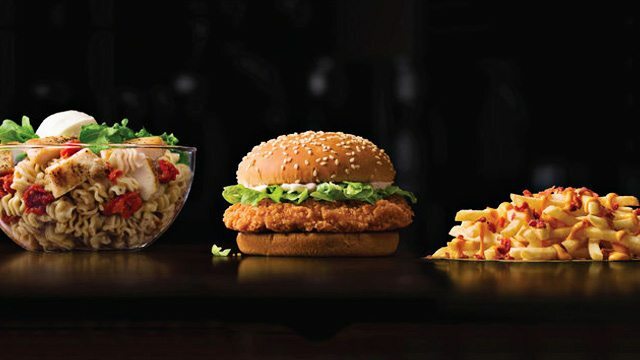 Every bite leaves your mouth in suspense.